West Ham would likely block any move from Tottenham Hotspur to ground-share at the Olympic Stadium, according to Hammers' vice-chairman Karren Brady. 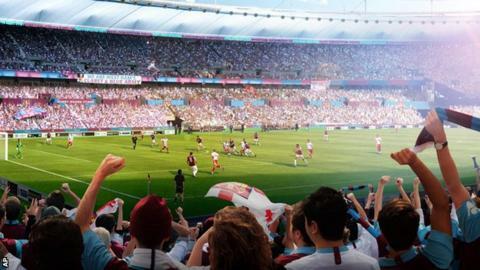 West Ham move into the Olympic Stadium in the summer of 2016, while Spurs could be looking for a temporary home while their new stadium next to White Hart Lane is constructed in 2017-18. "No-one has asked us for our permission (to ground-share) and if they did we would probably say no, depending on who it is - if you get my drift," Brady, 45, said. "We are the anchor tenant for the winter matches and nothing else can happen in that time without our permission. "Our football matches take priority over everything else." Tottenham said last week they had revised the construction timetable for their new 56,250-capacity stadium, next to their current White Hart Lane ground, while their plans are being challenged by current landowners. The legal wrangle means they are "highly unlikely" to move into their new stadium as scheduled for 2017-18. Other potential ground-shares include Wembley and Stadium MK in Milton Keynes. West Ham, who will be leaving their current Upton Park home, could veto a potential move by Spurs to the Olympic Stadium, even if Tottenham agreed a deal with the London Legacy Development Corporation. Brady was speaking at the launch of the Club London members' scheme, which will see 3,700 hospitality spaces in the 54,000-capacity stadium.